A bigger part of Europe is without power and means of communication. Control centres are wiped out and hours are passing without backlashes simultaneously as rival troops are crossing the borders. Time is meagre and hundreds of thousands of lives are at stake. Body guard Christian Vindelby ends up in the middle of the installment of a new government, Johanna is stuck in a desperate juggernaut duel and Jonas is stranded in the chaos south of Uppsala with the kids, at the same time as a huge responsibility are laid upon his shoulders. In the defense centre of Moscow, Misja’s fight for survival has only just begun and in the USA, hidden forces are working to escalate the situation further. When old leaders fall, one no longer can control who will take their place. One desperate plan is formed, but the question is if everyone is prepared to pay the price? Everyone who has ever read a book knows that it can sometime start off kind of slowly and uneventful. Even if it is the second or third or 7th book in a series. 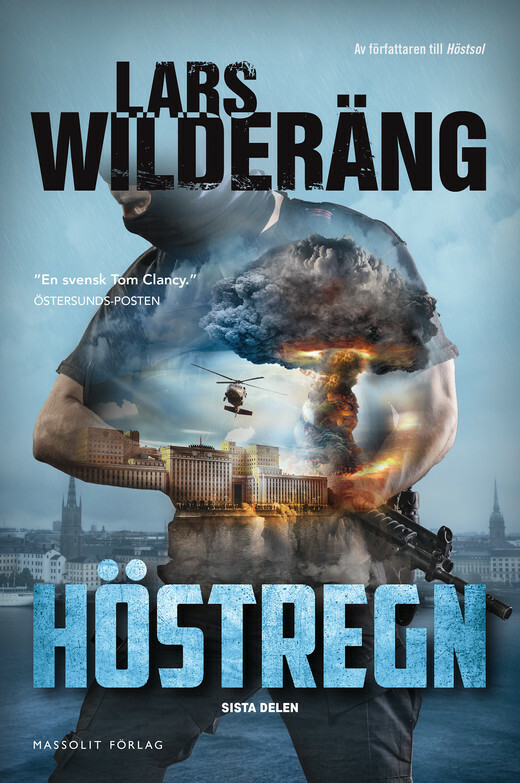 I have found the exception that confirms the rule: Höstregn, the sequel to Höstsol by Lars Wilderäng. Everything starts at page one! Taking off exactly where Höstsol ended, at the cliffhanger. The feeling of hopelessness that joined me in the end and taunted me with one year of waiting for the sequel joined me right away on page one. And kept going for a long while. It looked very very bad for the poor Swedes. And honestly, it is not until the very end that hope comes forward. I like that it is stated pretty early on about a big secret mission, but you don’t really know until the very end what it is about. 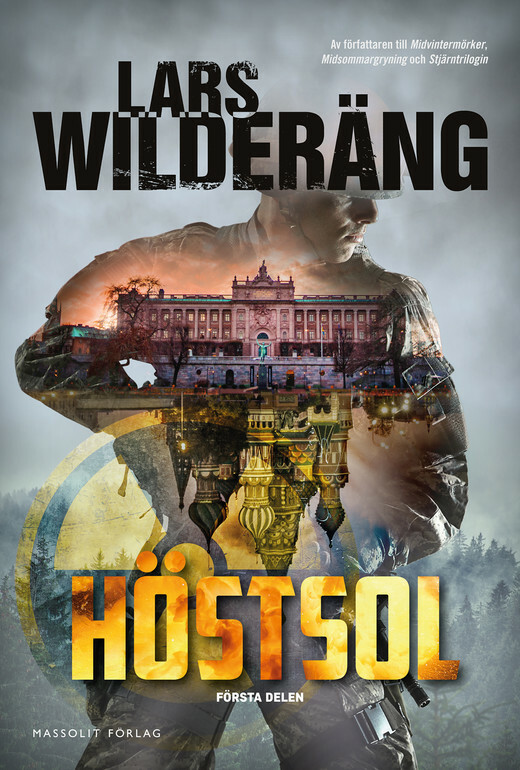 Like with all the other books Wilderäng has written, it follows many characters and at first I felt that it was hard to get to know the different ones, that his type of writing is better to give a full overview of the plot, rather than following the personal developments of the characters. But I changed my mind towards the mid/ending. I did feel with the characters, I felt what they felt and even started crying a little bit at one point. If I remember correctly, Höstsol had lots of military details and I had a hard time following exactly everything that happened because it was sort of easy to zone out when details occupied page after page. This was easier to understand. I wouldn’t say less detailed, because it still was, which made it super realistic, but it was easier to follow. More feelings involved perhaps? Easier to relate to. The reason Höstsol only got a 4.5 is because of what I just wrote in the paragraph above. And since that is not applicable in the sequel, Höstregn gets a 5! It is early September and in the archipelago of Stockholm, another submarine hunt is underway, but this time a civilian manages to capture something on camera, something that puts high pressure on the already shaky world situation. At the staff in Moscow, a colonel takes a crucial decision and a Diplomat at the Russian embassy is everything but what he seems to be. At the same time, an American task force in Iraq makes a discovery that will get dire consequences. Back home in Sweden, Johanna tries to put all her energy on her practicing squadron instead of on her wrecked relationship. Her ex Jonas starts his new job as crisis preparedness officer in Uppsala while his brother Christian is positioned as a body guard by the eccentric and hard-to-deal-with Minister of Foreign Affairs’ side. Soon it will dawn on them all that the safe reality they for so long had taken for granted, slowly but steady is going to change. Before you start reading this review. I want to ask you if you are Russian. If you are, then I can promise you that this book will be very boring and dull and you can stop reading this review now. Okay, good, now we have lost all the Russians. I wouldn’t want to have it on my conscious to recommend a book that potentially could lay waste to Sweden as we know it. The Russians in this book had a really impressive, and really scary and realistic strategy of taking over our beautiful country. Maybe this book should stay untranslated? If you are a regular reader of my blog, or just read the blog description here on the right side, you know that I am fairly picky when it comes to choosing the next book. I love to dream myself away in a fantasy or sci-fi world. Why would I want to read something that could happen in the real and kind of “boring” world we live in? I rarely get out of my comfort zone and it takes a lot of time for me to actually pick up a book recomendation from a friend. But every now and then I surprise even myself. But still not entirely out of my comfort zone though. I knew what I was getting myself into this time. Why step out of the comfort zone by three large steps when you can take a single step and read something from one of your favorite authors? I know that Lars Wilderäng is a really good author after reading Stjärnklart. Even if the subject of this one might not interest me as much as sci-fi does, I at least knew that the writing would be good. And I am glad to say that I was correct. I am not disappointed. The writing style is exactly the same as in Stjärnklart. We get to follow lots of different characters which gives the reader a completely different view on the world he is painting. You get to see everything at once instead of just following one character’s developement and interpretation on situations. In this case that type of writing really works (as it also did in Stjärnklart). Although, it leaves the reader with not just one cliffhanger, but several at the end. There is one downside of writing like this, and that is that it is really hard to keep track of all the characters. Maybe not after getting to know them later on, but at least in the beginning. It is also hard to remember who did what after a while. And it is especially hard to keep track on characters that don’t recur as much, or maybe just one time. One thing that I, as an aspiring author, struggle with is the balance between journey and action. Siri Pettersen’s book Odinsbarn (“Children of Odin”) was one of the best books I have ever read and it was full of journey sections. And long ones. But it still made the book amazing. Höstsol is the complete opposite. It is full of action and barely any journey sections at all. And is as amazing. From chapter one you realize that something huge is about to happen and you just continue to read on to find out what and how it will happen. It is impressive that Wilderäng can keep up the quality of the story along with so many things happening all the time. It never gets boring. The reason why it “only” gets a 4,5 out of 5 is because I have basically no knowledge of any military things or strategies or weapons or anything at all. It was super cool that my grandpa was an army tank driver before he retired, but it stopped there, at the profession being cool. Since I knew nothing about the technicalities of it all, it was hard to understand sometimes. I understood the story, but why the characters did as they did, what everything was and how they reached conclusions and so on, was completely out of reach and understanding for me. What that means though, is that Wilderäng has truly done his in-depth research and made the story so incredibly realistic and scary. The details are definitely needed in this kind of story and he places them exactly where they are needed to make the full picture perfect. I am impressed, Wilderäng! You were able to make me love a book that I wouldn’t have even looked at, much less bought and gotten signed. Kudos to you! A lot of people are telling me to read books that they loved. Most of the times, it takes me a long time to actually get to read them. One of my biggest regrets is Throne of Glass, it took me way too long before I read it from when someone told me about it. One exception to this behavior of mine is Lars Wilderäng’s Stjärnklart series. I read it almost instantly and I loved it! One of the best series I have ever read. I know a lot of people who think the ending is too spaced out, but I loved it, it was the perfect ending to that story. Anyway, to my starstruck-story. Yesterday I had a friend from Cal Poly here for a day and I just had to show him my favorite store (and probably his new favorite store): Science Fiction Bokhandeln. When I was there I saw a sign that tomorrow (=today) Lars Wilderäng woud be there to sign his new book, Höstsol. I have a really bad cold right now, but that didn’t stop me from going. I usually don’t get starstruck around celebrities, and wasn’t at first today either. I was a loss at words first, but then told him that I loved Stjärnklart, and told him, somehow (I honestly don’t know in what order I said stuff or how I got to it, but we talked for a little while) that he had already sent me signed copies of the whole series because I wrote reviews last Christmas. Want to know something funny? He remembered me! And this is where I got starstruck! He told me that my blog post, written in English, was used to promote the book abroad!!! Somehow, I also got it in there that I am writing my own book in English (because he remembered my review specifically since they were in English). I told him that I currently have 17k words and he told me that I should aim for 100k words. He also asked me what it was about and it looked like he slightly nodded approvingly when I briefly told him the story in two sentences. Or at least that’s what I will remember to keep myself motivated to keep writing. This is definitely on my list of cool stuff that I have been through! Christmas came early this year when I the other day got a package in the mail. Earlier this week, Massolit Publisher had a contest on Instagram where you could win the whole Stjärnklart series signed by the author if you knew the name of the third book in the series. The contest was over before I even saw the post, bummer. But I tried contacting them anyway, the contact person was the one I had been in contact with when writing my reviews. 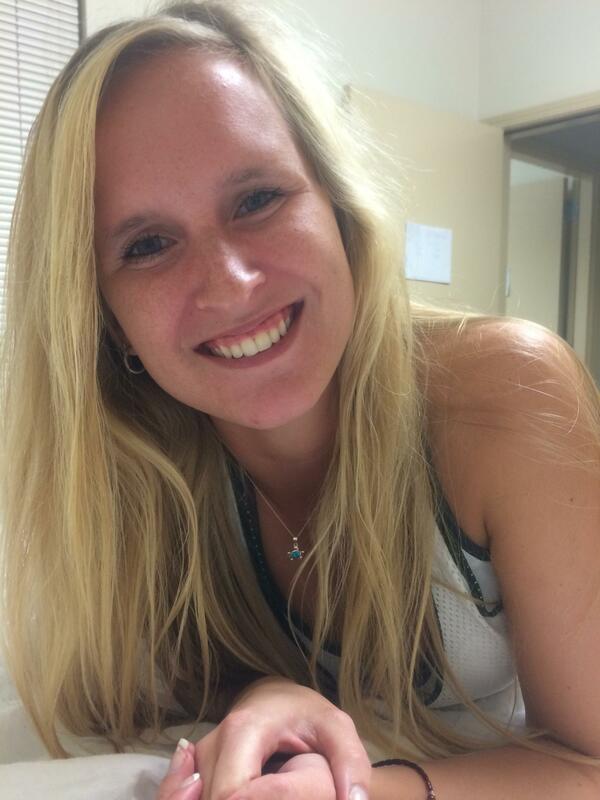 She replied very quickly that they were already on their way to me, sent from the auhor himself. So cool! They are now an important part of my bookshelf! Thank you, Lars Wilderäng! The civilization which was slowly but steadily rebuilt, 10 years after the Shutdown, has been completely shredded. No bullets in the world can protect them against the enemy which was close to exterminate them all. And who proved way worse than the most horrific nightmare. Some of the few survivors have once again gathered at Carlsten’s fortress, trapped like rats surrounded by threathingly black eyes. There has to be a way to stop this threat, even if it is the last thing they will do. The question is how will they get out of captivity, and if there are more survivors out there? As always when I finish a series I feel sad. Especially when it is such a great series as this one. I am satisfied with the ending, it was extremely unexpected. Or maybe I have been too stressed while reading this, about school stuff that I just read it without thinking about what could possibly happen next? In either case, I found this last book in the amazing trilogy very unexpected (it was hard to guess what would come next in the first two as well). Lars Wilderäng really makes you sit on the edge of whatever you are sitting on and he totally makes it impossible to put down the book unless you fall asleep with it in your hand (yes, that has happened almost every night). The finale was shorter than the other two and it was noticeble, but it was still full of action as the second, until the very very end. I don’t want to spoil it for anyone and since I am new at writing reviews, I haven’t really learned how to write reviews further along the road of a book series. But, I loved this book, I loved the series, I loved all the excitment, and most of all; I loved the realism of the story. Like I said in my previous reviews, this feels feasible, this is how the world could end one day and I wouldn’t be surprised. I want to thank Lars Wilderäng for this experience I got, reading the Stjärnklart series for the past three weeks. I hope I will be able to enjoy other books after this, haha! I also hope that Wilderäng wants to continue writing in this universe, I see great potential for more books! (I also can’t wait for the TV show!) Anyway, easy five out of five! Everyone should read these three books! I MEAN IT! READ! IT! The main reason why I am writing book reviews now, are because of my friend Elin (tickmicks bokblog) whom I know from Liseberg. She is as crazy as I am about books. Okay, she is probably more crazy honestly. But she inspired me and made me realize that I could contribute to the world about the experience and enjoyment I get from reading books. Now in hindsight, I wish I did this a long time ago. I have had this blog for almost four years now and I have read tons of books since then. They were a big part of my life in California and on my travels and have made me associate make books with great memories. Anyway, Elin and I talk every now and then about books and she keeps telling me that she gets recex, which is short for recensionsexemplar, which I guess translates to review copy (=revco?). It basically means that you get books for free to write reviews on them. I decided to try this out for myself since I am actually writing reviews now. So I contacted a publisher a few days ago, and today I got it emails with links to download .epubs of the whole “Stjärnklart”-series. Unfortunately for you who don’t speak/understand Swedish: the books are in Swedish and there are no translations yet, that I know of. But if you like the review (which will be up in about a couple of weeks I guess, or sooner depending on how awesome it is) and think that the books sounds interesting, I am sure they will be translated soon enough, they are a huge success in the postapocalyptic dystopia category here in Sweden right now. I am at the point in my blogging that I can ask publishers for review copies, but I am still waiting for authors to contact me. But on the other hand, this way I can ask for books that I really want to read, so it’s not too bad. I think I will go and lie on the couch now and start reading Stjärnklart (or should I continue with Resan till Ljuset? ).